If you’ve taken a peek at our 2018 Seminar Calendar, you’ll notice that we’re finishing up our last seminar of the year. 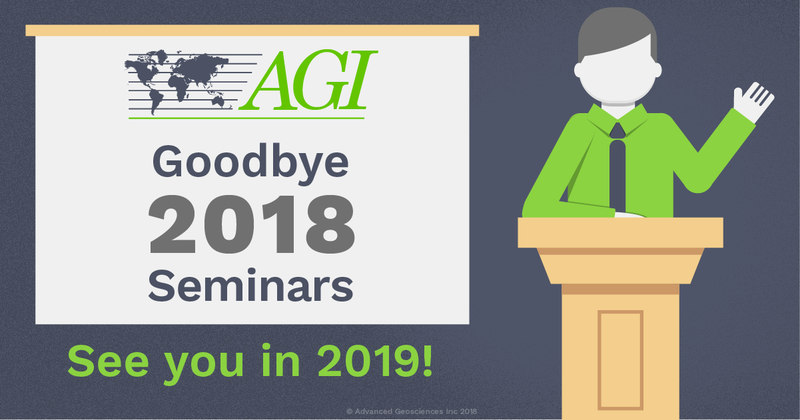 This year, we’ve hosted several seminars between the AGI and AGE offices—which has allowed us to speak to so many of our customers face to face. While it’s a lot of work to put our seminars together—we’ve enjoyed every minute of it. We always get tons of great questions, feedback, and ideas to take into next year. Speaking of next year, we’ll let everyone know once the 2019 seminar schedule is finalized. We’ve also been thinking of ways to add webinars into the mix! But until then, the AGI Help Desk is available 24/7. So far, there are 100+ articles covering ERI, survey prep, and AGI instruments. If you have a question about anything AGI-related—there’s a good chance that you’ll find the answer there. We even have a chatbot that can search the Help Desk archives for you. You can find the chatbot at the bottom of any web page on our site. And if you need to speak to someone directly, our stellar support team will still be available for the remainder of 2018. You can reach out to us on our Contact page—or if you’re already working with an AGI representative, you can email them directly. We’ll continue our commitment to educating our customers so that they have the confidence to use—and teach others to use—our instruments. Special thanks to anyone who has attended our seminars this year. The time and financial commitment to attend our seminar is not lost on us. As such, we appreciate all of our attendees. Who knows, maybe we’ll see you again next year!